The post-recession uptick in the population living in multi-generational arrangements has been particularly pronounced among young adults ages 25 to 34. 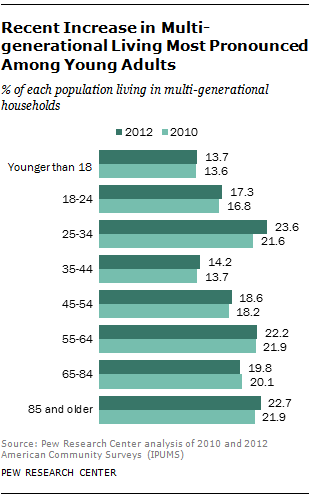 In 2012, 23.6% of this age group lived in a multi-generational household, up from 21.6% in 2010. Historically, the oldest Americans, those ages 85 and older, have been the most likely to live with multiple generations of family. However, in 2011 young adults ages 25 to 34 eclipsed those ages 85 and older as the group most likely to live in a multi-generational household. By 2012, 22.7% of the oldest Americans resided with multiple generations of kin, compared with 23.6% of young adults ages 25 to 34. Looking back to 1980, young adults ages 25 to 34 were less likely (11%) than the population as a whole (12.1%) to live in a multi-generational household. The past 30 years have seen a sharp reversal, with young adults ages 25 to 34 (23.6%) now substantially more likely than the general population (18.1%) to live in these types of households. Some of the long-run increase in multi-generational living arrangements among young adults is due to their greater difficulties in establishing economic self-sufficiency as a result of declining labor market opportunities (Sironi and Furstenberg, 2012; Kahn, et. al., 2013). This is particularly true for young men without a four-year college education. For example, real hourly wages declined between 5% and 25% for men with less than a bachelor’s degree between 1979 and 2010, with the steepest declines among the youngest and least-educated men. By contrast, women with at least a high school education have experienced wage gains (Autor and Wasserman, 2013). There have also been well-known changes in the social behaviors of young adults. This generation of young adults is marrying at later ages, so the pool of unmarried young adults—a group much more likely to live with their parents—is expanding. According to the Census Bureau, the median age at first marriage in 2013 is estimated to be 29 for men and almost 27 for women. In 1980, the median age of first marriage for both men and women was between four and five years younger. 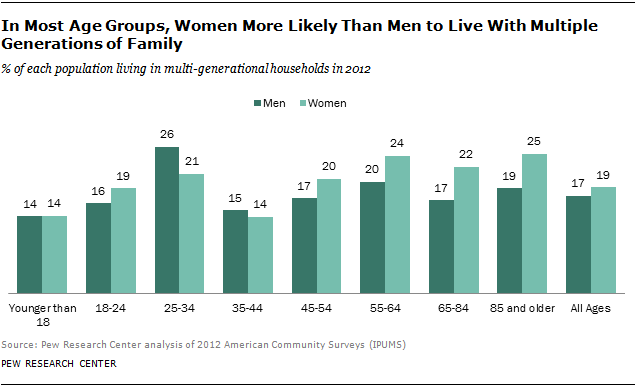 In general, women are more likely than men to live in a multi-generational household. In 2012, 19% of women lived in such arrangements, compared with 17% of men. This partly reflects the likelihood that women, on average, live longer than men. In addition, women ages 65 and older are much less likely than similarly aged men to be married, and, just as with young adults, older adults who are unmarried are more likely to live in multi-generational households. The main exception to this general gender pattern in multi-generational living arrangements occurs among young adults age 25 to 34, where young men (26%) are significantly more likely than young women (21%) to live with multiple generations of family. Young men ages 25 to 34 are more likely than men ages 85 and older to live in multi-generational households (19% of older men do). By contrast, women ages 85 and older are substantially more likely to live in a multi-generational arrangement (25% do) than are young women ages 25 to 34 (21%). In census data, each household is counted as being headed by one person, generally the one who owns or rents the house or apartment. Since the household head might be construed as the household member with the greatest financial resources and most financial independence, there is considerable interest in determining who is living with whom in a multi-generational household. For instance, in a two-generation multi-generational family household, are the parent and the adult child (age 25 or older) living in the parent’s home or the adult child’s home? That is, which generation is the head of the household? By and large, the patterns of relationship to the head of the household have not markedly changed from 1980 to 2012. In 2012, most young adults living in multi-generational households were the child of the household head and hence living in their parent(s)’ house. 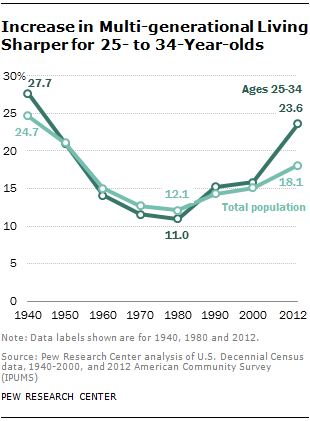 Among those ages 25 to 34, 80% fell into this category in 2012. As adults age they are less likely to be living in a parent’s household and more likely to be either the head, the spouse of the head or living in a household headed by their adult child. Among 65- to 84-year-olds living with multiple generations of family, nearly two-thirds (64%) were the head or spouse of the head. It is only among the nation’s oldest Americans in multi-generational households in which a majority (59%) are the parent of the head and hence living in their adult child’s abode. One significant change in these overall patterns has been among children living in multi-generational households. Increasingly these children live in their grandparent(s)’ house, not their parent(s)’ house, suggesting that economic assets and wherewithal have shifted from young adults toward older adults. In 1980, only 39% of children younger than 18 in multi-generational arrangements were the grandchild of the household head. 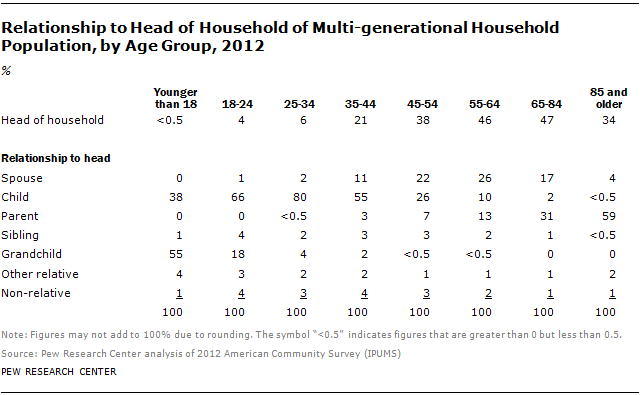 By 2012, many more children younger than 18 in multi-generational households were the grandchild of the head (55%). In most cases, when a child resides with a grandparent, at least one of the child’s parents also resides in the household. In 2012, such children typically lived in the grandparent(s)’ house, not their parent(s)’ house. The share of people living in multi-generational households has increased across most racial and ethnic groups in the post-recession period. Non-Hispanic whites have experienced the greatest increase on a percentage-point basis. In 2012, 14.3% of non-Hispanic whites lived in a multi-generational household, up 0.6 percentage point from the 2010 level (13.7%). Some minority populations have also become more likely to live in multi-generational households since the recession ended. 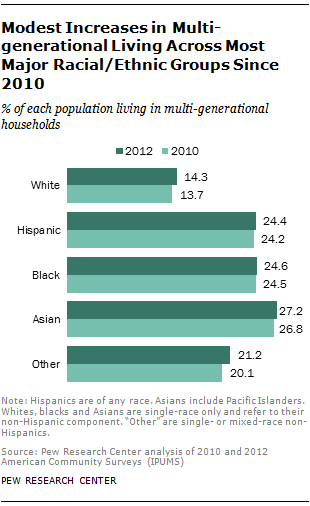 In 2012, Asian Americans were the racial or ethnic group most likely to live with multiple generations of kin (27.2%). Using census data, it is difficult to know how far back historically Asian Americans have held this distinction due to the changes in census racial classification that occurred in 2000. By comparison, about 25% of blacks lived in a multi-generational household in 2012. 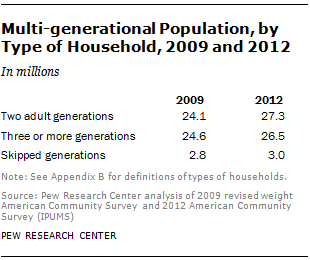 Among Hispanics 24% lived in multi-generational households in 2012. Of the 56.8 million people living in a multi-generational household in 2012, 27.3 million (48%) lived in a household made up of two adult generations of the same family (with the youngest adult at least 25 years of age). Another 26.5 million (47%) lived in a household with three or more generations of family members. Nearly 3 million (5%) lived in a “skipped” generation household consisting of a grandparent and grandchild, but no parent. This is a slightly different pattern of prominence by type than observed in 2009, when the population in three or more generation households slightly outnumbered the population in two adult generation households.